Look what finally arrived. I totally forgot to post this. I’ve had it back for a few weeks now. Excited doesn’t even cover how I felt when I opened the box. All it needs is squaring up and the binding. My friend Teri suggested bias binding. I just have to make the time for this baby. The quilting was done so beautifully I don’t want to ruin it with sloppy binding. If you’re wondering about the layout. 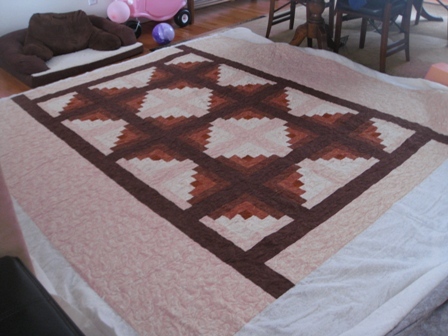 Prior to sending it out to be quilted Teri and I discussed making it wider. The length was right but I really wanted it to drap my queen size bed instead of just “sit” on the top. Eileen of Designing Quilts, the quilting queen as I’ve nicknamed her, added the borders for me and the inadvertently bordered log cabin is the result. I just love it. I put it on the bed for a test run and loved the effect. I really have to make time for this one. Oh…my contant lament…there are not enough hours in a day.